Whitey's Lindy Hoppers was a professional performing group of Savoy Ballroom swing dancers, started in 1935 by Herbert "Whitey" White. The group took many different forms, with up to 12 companies dancing under the company name. 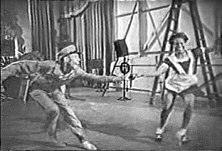 In addition to touring internationally, Whitey's Lindy Hoppers appeared in a number of feature films and Broadway productions. Dorothy Dandridge and Sammy Davis Jr were two of the many celebrities to join the troupe. The Lindy Hoppers have inspired theatrical movement across the spectrum. Acrobats, figure skaters, Bob Fosse and Britney Spears all have Lindy Hop to credit for how they jive. This Lindy Hop clip featuring Frankie Manning (in the dungarees) can't help but make you shimmy, smile and shake. The moves of Hellzapoppin' take years of experience and rehearsal. For those of us still stumbling over our own feet, we have to start somewhere. Howcast produced this tight video breaking down beginner's Swing Dance, step by step. Nice and slow. Next stop, Broadway! Previously on Wonder of the Day, Acrobatic Pole Dance and Beyoncé's Single Ladies.